Find inner peace with this intricate floral ring. 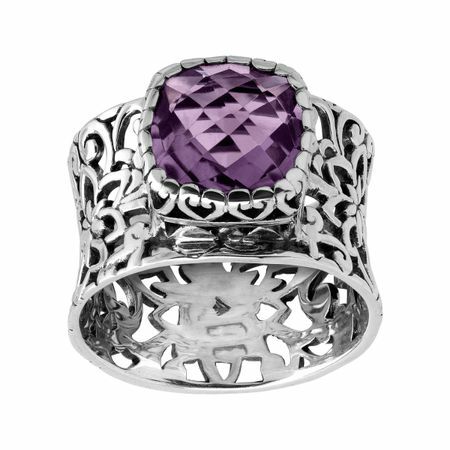 A wide band, crafted in quality sterling silver, gets a unique update with floral cut-out designs and a gleaming royal purple amethyst set on the face. Ring face measures 1/2 inches in width. This piece is part of our Balinese Collection, inspired by the beauty of Southeast Asia and handmade in Bali using ancient silversmith techniques. Piece comes with a “.925” sterling silver stamp as a symbol of guaranteed product quality.